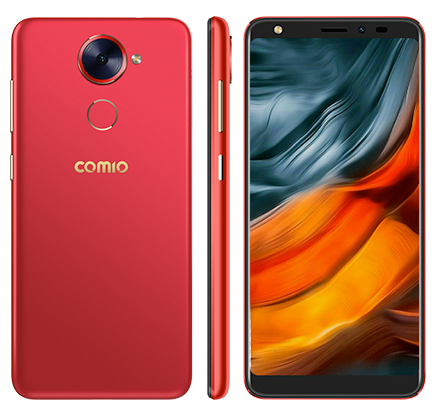 Comio today launched Comio X1 smartphone in India which comes with Dual 4G VoLTE, 18:9 Display. Comio X1 has a 5.5-inch HD+ IPS display powered by a quad-core MTK6739 processor coupled with 2GB RAM and 16GB of internal storage. On Camera, it has a 13MP Rear Camera and 8MP front-facing Camera. It runs on Android Oreo Packed with a 3050 mAh battery. It comes with Face unlock, Fingerprint Scanner. COMIO X1 also features a bike mode where the smartphone turns off all the notifications on the device when the user is riding a bike. It also automatically responds to the callers telling them that the user is currently riding a motor bike and will call them later. Comio X1 comes in Red Hot, Sunrise Gold, Royal Black color priced at Rs 7499.It comes with 1 year plus 100 days’ warranty. The warranty also includes 1-time screen breakage replacement and 30-day phone replacement. The smartphone is available at key retail stores across India and online platforms such as Flipkart, Amazon, and Snapdeal. Users can also exchange their old COMIO smartphone with an assured 40% return policy (if the phone is not older than 12 months). Offers include one by Reliance JIO where the users get Rs 2,200 as cashback (40 x Rs50 vouchers) at the time of first successful recharge of Rs 198/299. The other offer is by Idea where the company is providing 60GB additional data with the recharge of Rs 199 (10GB per month) to its users.